Sony today announced three new Walkman® MP3 players (NWZ-A860, NWZ-S760BT, NWZ-E460 models), each delivering premium sound, a sophisticated design and enhanced features to satisfy any music lover. The three new Walkman models share a sleek new design and include enhanced features such as Media Go™ software to easily transfer music, videos, playlists and photos to your Walkman player. Users can drag and drop unsecured data from iTunes® for Windows®, Windows Media Player or Windows Explorer. All three new models also feature Sony's exclusive Clear Audio Technologies for superior sound quality and include a Karaoke Mode, bookmarking with multiple playlists and a language learning function. Users can also create channels with the SensMe™ feature, which keeps your music in tune with your mood by automatically categorizing your music tracks into different channels. The synchronized lyric feature allows users to load .lrc files for songs and set the lyrics to scroll by in sync to the music. Built-in voice recording uses the integrated microphone and adjustable bit rate to make the voice recording function easy to use. Multiple high-quality audio and video formats are supported by all three new models, giving users more freedom to download the files they want. The A-Series and S-Series models introduce streaming via Bluetooth® to wireless headphones, compatible car audio head units, speaker docks and other Bluetooth-enabled devices while the E-Series introduces five eye-popping new colors – black, red, blue, green and pink - to match your personal style. The Walkman A-Series (NWZ-A860): The Walkman player of Audiophiles' dreams, delivering the best-of-the-best audio experience. * A 2.8" WQVGA (400x240) TFT touch screen delivers incredible color for fast, rich viewing of photos, videos, and album artwork. The hybrid operation system provides intuitive touch panel controls and traditional button controls for playback. * The 2" QVGA (320x240) high-brightness screen, color LCD provides fast, rich viewing of photos, videos, and album artwork. Comes in 4 GB, 8 GB or 16 GB options: 4 GB - $79; 8 GB - $89; 16 GB - $109 (SRP). 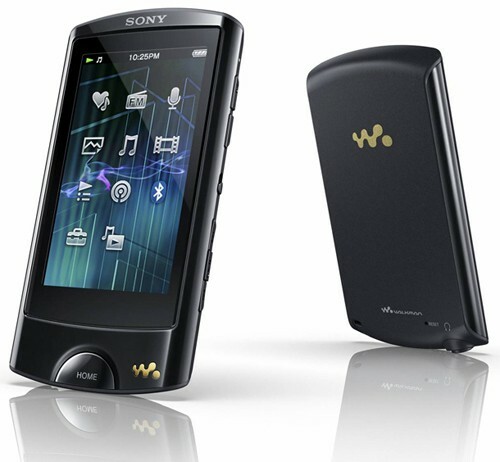 The Walkman A-Series, S-Series and E-Series will be available September 2011 at Sony Stores including online at http://store.sony.com and other authorized retailers nationwide. For images and information, please visit www.sony.com/news.